The Tourist Ticket (also known as the Tourist Travel Pass) can be used on all types of public transport in the Region of Madrid. Allowing you to take unlimited trips within your chosen timeframe, it is a practical and inexpensive way to get around Madrid. Passes are valid for 1, 2, 3, 5 or 7 days and for two zones (A and T). Metro Ligero light rail train ML1. All blue city buses (except the Airport Express shuttle) and the green intercity buses in the Region of Madrid, including services to Guadalajara and Toledo. This pass encompasses all 8 zones, from A to E2 (6 zones in the Region of Madrid and 2 in Castilla La Mancha). All Renfe Cercanías commuter trains (zones 0, A, B1, B2, B3, C1, C2). Metro Ligero light rail trains ML1, ML2 and ML3, and the ML4 Parla tramway. Zone T is the recommended option if you’re planning on making day trips to places like El Escorial, Aranjuez or Alcalá de Henares. IMPORTANT: It cannot be used on high-speed trains (including the AVE to Guadalajara and the Avant to Toledo) nor Renfe Operadora regional trains. All Tourist Travel Passes are pre-loaded onto the Tarjeta Multi, a contactless, transferable smartcard that is valid for 10 years and which is free when you purchase the 1,2, 3, 5 or 7-day Tourist Travel Pass. Once the Tourist Travel Pass expires, you can top up the smartcard with pay-per-ride tickets. Why buy a travel pass? 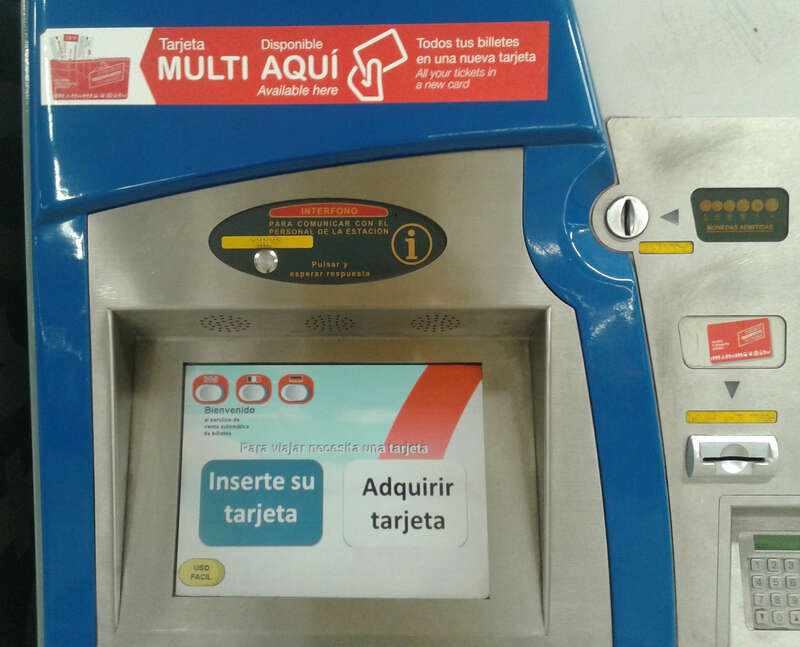 All Metro stations (including the airport stations Aeropuerto T1-T2-T3 and Aeropuerto T4) from ticket machines that have a red sticker saying Tarjeta MULTI Disponible AQUÍ. The main office of the Madrid Regional Transport Consortium: Plaza del Descubridor Diego de Ordás, 3. Estancos (tobacco shops) and from other authorized retailers. All Metro Ligero (ML1, ML2, ML3 and ML4) stations. If you do not wish to acquire a Tourist Travel Pass, you can buy the Tarjeta Multi (2.5€) and simply top it up with pay-per-ride tickets. * Prices are for 12-year-olds or over. Children under 11 years of age enjoy a 50% discount. Under-4s travel for free on the metro and the bus and under 6s on the Cercanías commuter train. Spend the day at a UNESCO World Heritage site, hire a guide to teach you interesting historical and cultural facts about Madrid, or follow one of our themed itineraries to discover the city from a different angle.